(Phys.org) —A team of researchers working at the Polytechnic University of Turin in Italy has found that applying herring sperm DNA to cotton fabric caused it to be resistant to burning or catching on fire. In their paper published in the Journal of Materials Chemistry A, the team describes how they applied the sperm as a coating to a piece of cotton test fabric and tried to set it on fire, to no avail. DNA's natural structure makes it an ideal intumescent (substance that swells when heated) fire retardant—it has a backbone of sugar and phosphate and has a nitrogen base. For that reason, the researchers chose to test its ability as a fire retardant coating on a normally highly flammable cotton sample. Their process was simple and straightforward—they extracted DNA from herring sperm, dissolved it in water, applied it to a sample piece of cotton, let it dry, then tried to get the sample to burn using a methane flame for several seconds. Their tests showed that the sample would not ignite and that the cotton fabric was not burned as a result of the application of the flame. The coating works because when DNA is heated the phosphate in it gives off phosphoric acid, which pulls water from cotton fiber and in the process leaves behind a residue rich in carbon, which is of course resistant to burning. The nitrogen in DNA also releases ammonia causing a dilution of flammable gasses. Together the materials that make up DNA, when subjected to heat, cause the buildup of a foam rich in carbon and the formation of a glassy outer coating that is also rich in carbon. This new research indicates that DNA could be used as a flame retardant, though it does have some hurdles to jump before that is likely to happen. First, it must be determined that such a coating would not allow for DNA fragments to make their way into the person's body that was wearing material treated with it. There's also the cost—using current methods would make it three to five times more expensive to manufacture than conventional flame retardants. Also, unfortunately, its biodegradable desirability factor which would make it a good "green" alternative to current chemicals used in flame retardant coatings, is also its downfall—it doesn't survive washing. For the first time, deoxyribonucleic acid (DNA) from herring sperm has been employed as a novel flame retardant system for enhancing the thermal stability and flame retardant properties of cotton fabrics. Indeed, DNA could be considered an intrinsically intumescent flame retardant as it contains the three main components that are usually present in an intumescent formulation, namely: the phosphate groups, able to produce phosphoric acid, the deoxyribose units acting as a carbon source and blowing agents (upon heating a (poly)saccharide dehydrates forming char and releasing water) and the nitrogen-containing bases (guanine, adenine, thymine, and cytosine) that may release ammonia. 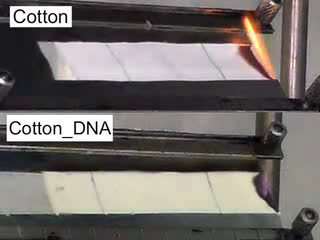 The flammability tests in horizontal configuration have clearly shown that after two applications of a methane flame for 3 s, the DNA-treated cotton fabrics do not burn at all. Furthermore, when exposed to an irradiative heat flux of 35 kW m−2, no ignition has been observed. Finally, an LOI value of 28% has been achieved for the treated fabrics as opposed to 18% of the untreated fabric. Phosphates are well known flame retardants in general and definitely cheaper (i.e. greener), than sperm of some herrings. One should never flame the truly retarded. But those who are willfully retarded should be flamed with abandon.